If you have done any research on successful workplace wellness program models, then you know it’s not so much about what you do but how you do it. Introducing new programs can be fun and exciting, but interest may taper off over time. If you can manage to shift the entire culture and atmosphere of your workplace towards a healthier and more wellness-focused perspective, then your wellness program will be successful. Engagement is far more important than your budget, the time and effort spent, or what workplace wellness programs you choose. The purpose of a corporate wellness program is to benefit both the employer and the employee. That will look different for each company. But in the long run, participation will show you if you’re accomplishing your goal or not. Many companies ask us what programs they should incorporate into their workplace. If you’ve already laid the foundation for a health conscious environment in your office, then you’re ready to choose some tried and true workplace wellness programs for your wellness strategy. Though there are a huge variety of programs that can benefit the employees, save the employer money, and help everyone become healthier together, there are a few options that are usually successful everywhere they’re used. 42 million Americans smoke cigarettes regularly. There is most likely at least one person in your office that smokes, if not many more. People who smoke have to take smoke breaks often, which cuts down on productivity. They are putting themselves at risk for a variety of health problems including gum and lung disease. If they already have medical problems, cigarettes will make them worse. This means more medical bills and more missed work. 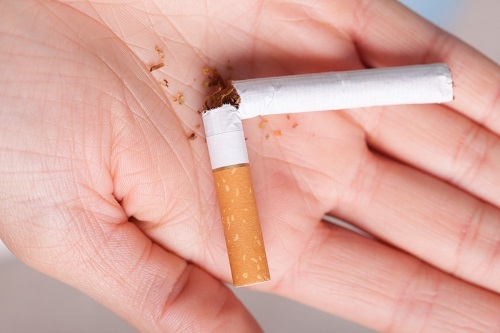 Implementing a smoking cessation program as one of your workplace wellness programs is a great idea. You can provide support and encouragement to smokers who really want to quit. Harness the power of the group by using team challenges to motivate people to get involved and get healthier. You can invent your own team challenges or use some of our classic examples. The key to group challenges is to make sure there are some modified versions so that everyone can be involved. Don’t make them too difficult – the point is to rally the office together for a common goal, like losing a certain amount of weight or walking a certain distance. We love Corporate Lunch and Learns and always recommend them as one of the best workplace wellness programs to try. You can use this time to get the office together, eat a healthy lunch, and get educated about a variety of health and wellness related topics. You could even take a poll and find out what people want to learn more about. Planning a Corporate Lunch and Learn is low key and easy to do, no matter your budget. If you’re ready to start saving money on healthcare and inspire your employees to better health, contact Wellworks for more information about our workplace wellness programs. Visit our website to learn more or read our helpful blog.